St. Scholastica is instituting a test-optional admissions policy for its undergraduate applicants. The 107-year-old private college, which is on US News & World Report's list of top regional universities, will no longer require the ACT or SAT standardized tests as part of its application for admission. The change was made Thursday, Oct. 11, by a vote of St. Scholastica's Faculty Assembly. The Undergraduate Admission Committee and the College's Enrollment Management and Academic Affairs divisions recommended the move. 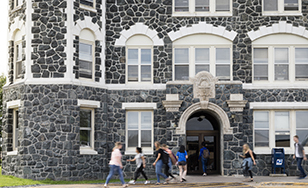 "This new policy reflects our commitment to access and to an admissions process that considers a full range of measures in order to assess a student's optimal potential for success at the College," said Dr. Colette Geary, St. Scholastica President. "National studies have shown that the best predictor of college success is a high school student's curriculum and GPA. We have also studied our own internal data, which indicates that high school GPA is a stronger predictor of persistence to graduation than a standardized test score." Applicants are still able to submit an ACT or SAT score if they choose, but it is no longer required. The change affects students now applying for admission to the fall 2019 class. St. Scholastica's traditional undergraduate enrollment is about 1,700. Its overall enrollment, including graduate and online programs, is about 4,050. More than 1,000 accredited, four-year colleges and universities are now test-optional, according to the National Center for Fair & Open Testing, and the number is growing. The Center promotes test-optional policies based on national research that shows the implicit bias in high-stakes standardized testing, especially for student groups currently underrepresented in higher education. St. Scholastica is the first baccalaureate college in Northern Minnesota to adopt a test-optional admission policy. Ellen Johnson, vice president for Enrollment Management at St. Scholastica, said the new admission process is expected to increase the diversity of St. Scholastica's applicant pool. "A standardized test score can be an appropriate part of the application process for some students," she said, "but not all. We want to give students the opportunity to present the best picture of their academic experience in high school. We look at who they are as a person and what they will bring to our learning community." St. Scholastica's Benedictine values also informed the decision, said Professor Jeremy Craycraft, chair of the Faculty Undergraduate Admissions Committee. "The main question we want students to consider when applying to St. Scholastica is: ‘How has everything I've done - from courses to activities, in and outside of high school - prepared me for the academic rigor and expectations of a St. Scholastica education? '," Craycraft said. "Our vision is that St. Scholastica's admission process will reflect our Benedictine values and honor the uniqueness of the individual." More information can be found on our Frequently Asked Questions page. This was covered by several local news outlets, including the Duluth News Tribune, KBJR-TV Channel 6, FOX-TV Channel 21, radio station KDAL-AM 610 and Howie Hanson's blog.